Washougal voters showed their support for schools in February 2015 by approving a $57 million capital improvement bond to address safety, student capacity and facilities needs for Washougal’s schools. Below is information to keep you up-to-date and informed on decisions, planning and progress of the construction process. Jemtegaard & Columbia River Gorge Site – Construction is on schedule and on budget. All but a few bid packages are completed. Gym: Underground complete, footings and slab poured and CMU walls being installed. Elementary Wing: Underground complete, footings and slab poured, steel delivered. Middle School Wing: Underground and excavation in progress, forming footings in progress, slab to be poured soon. Excelsior School – Construction is on schedule and on budget. Underground complete, footings and slab poured and frame walls and roof are in progress. Transportation – Construction is on schedule and on budget. Underground complete, footings and slab poured and metal building erecting has begun. Asphalt scheduled for end of September. Roof and HVAC at Gause and Hathaway – Project is on schedule and on budget. Roofing and HVAC is at 95% and working on construction review list. Safety and Security Improvements – Project is on schedule and on budget. Fire rated glass is scheduled for delivery early October. 95% completed and working on construction review list. According to the district’s master schedule for the projects, it is anticipated that Excelsior School, Jemtegaard Middle School and the new Columbia River Gorge Elementary School will open no later than August 2017. Signs of construction began appearing in the summer of 2015, when fencing was placed around Jemtegaard Middle School to assure student and staff safety in the current building while the new facility is being built. Groundbreaking took place in the late Spring of 2016. Each school’s front entrance was remodeled to provide better security to manage access to the building, and additional security cameras were installed at Washougal High School during Summer 2016. How will construction impact current school and sports programs? Fencing has been placed around the current JMS facility to keep students safe during construction. Sports fields will be impacted during construction and schedules will be adjusted to accommodate all teams and events on fewer fields. Cooperation of parents, students, coaches and sports leagues will be important as we work to continue our sports programs utilizing existing fields. Sports field work at the remodeled Jemtegaard Middle School will not start until demolition of the old building has been completed, and is not estimated to finish until Spring 2018.
Who is responsible for oversight of the construction process? The district has hired Richard Yeo of R&C Management to oversee the construction process. He will serve as the Construction Project Manager and will be engaged early in the design and planning phase, to ensure the project design meets the program requirements without exceeding the district’s budget. This collaborative approach will save time and money with a single point of leadership on the entire construction project. R&C Management has extensive school construction experience which includes all phases of the construction process. The team included in their successful application a commitment to maintaining the partnership with staff and community that the district has worked hard to build. R&C has demonstrated a commitment to successful collaboration with its clients and partners. In their proposal, R&C pledged to allow all stakeholders to have a voice in the process while assuring proactive and candid communications. Will WSD staff be involved in supervising the construction projects, and what are their qualifications? WSD Facilities Director Joe Steinbrenner is a 1985 graduate of the University of Washington with a Bachelor of Science degree in Building Construction. He holds a LEED AP certificate and worked for Washington State University from 2006 to 2012, supervising a number of major construction projects. Joe’s career has provided him with the opportunity to manage several multi-million dollar projects including the construction of two new elementary schools for the Salem/Keizer School District in Oregon. He started his career with his own construction company which provided him with first hand experience in all aspects of construction. Who else is involved in oversight of the projects? A team of citizens and staff members has been formed to assure projects are progressing as promised and that the community is informed throughout the process. The Citizen Oversight Team (COT) will meet monthly with the construction manager, R&C Management, to review project information, budget and schedule to assure that all projects stated in the bond measure are delivered to the public. The COT consists of community members Rene’ Carroll, Mitch Kneipp, Mike Lamb, David Stinchfield and Rick Thomas, WSD Facilities Director Joe Steinbrenner, WSD Board Member Ron Dinius, Rick Yeo and Adam Cormack of R&C Management, Casey Wyckoff of LSW Architects and WSD Superintendent Mike Stromme. The committee will meet for the estimated 30 months it is expected to complete all projects. These community committee members were contacted by the district and asked to participate based on their experience and expertise with construction, financial management and business experience. They are also actively involved in the community and trusted key communicators who will assist the district in keeping the community informed of the progress being made. Additional duties of the COT are to inform the community and WSD school board on the status of the projects, review expenditure reports, build community relationships to provide consistent information about the bond projects and aid the Board in developing processes to assure the bond goals of high quality, sustainability, student and staff safety and efficient buildings are met. Lastly, they will develop and prioritize a list of potential projects/expenditures to consider should there be any unspent bond funds at the conclusion of construction. 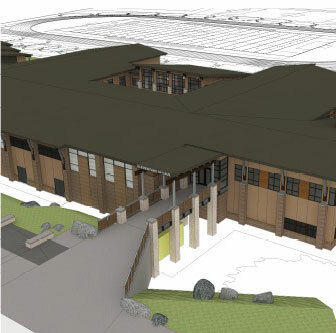 The Washougal School District has hired two local architects to lead construction design. BBL Architects was selected to work on the new transportation facility, safety and security upgrades at all district schools, and the roofing and HVAC projects at Hathaway and Gause Elementary Schools. The firm has considerable experience in the area of transportation facilities in area districts such as Beaverton, Centennial and North Clackamas. LSW Architects has been selected for design of the district’s three new schools. LSW is well-respected and has experience in new school design. What opportunity for input did parents, staff and community have on the features and design of the new schools? The district and architects solicited input on the desired features and amenities of our new schools through staff and community forums in the Spring and Summer of 2015. The district weighed input from stakeholders, while also recognizing the fixed budget for the projects. With this valuable input, these schools will provide excellent learning opportunities in our community for years to come. Has the Columbia River Gorge Commission permitting been built into the timeline? A full year of time was built into the construction schedule to provide time to work through the Columbia River Gorge Commission approval of the school. A representative of the district started early communication with the Gorge Commission, and the plans were approved without delaying the project. How did the district prioritize facilities needs? The district convened a Long Range Facilities Planning Committee in 2013 which met for over a year to evaluate the needs and conditions of school district facilities and prepare recommendations to ensure that Washougal school facilities support a safe, positive environment for student learning and success. The committee’s recommendations included several priorities for the district, including improving school entrance safety as well as planning for anticipated growth. The committee consisted of 18 members representing Washougal area citizens, district staff, two School Board members and other individuals with professional expertise in facility planning. They reviewed nearly 300 needs identified by the district and toured school buildings over the course of several months. The evaluation separated the needs into two basic categories – facility needs that should be funded through voter-approved bonds and facility needs that should be addressed through the district’s annual budget process. The highest priority identified by the committee was the need to improve the safety and security of every district school. The committee held a series of forums at each school in the district to solicit feedback from community members and share what they learned through their in-depth study of our schools. Will the district keep the current Jemtegaard Middle School gym? The district will not be able to continue use of the existing gym because of its location on the property, which is in the middle of the new football field.The new design has a gym for both the K-5 and the JMS schools. The current JMS gym will remain intact for use during construction until the new facility is ready for use. Have principals been hired for the new schools? When the new middle school and alternative high school open their doors, current Jemtegaard Principal David Cooke and current Excelsior Principal Carol Boyden are expected to remain in their administrative positions at the new schools. Both current principals are active members of the Design Team and are working closely with the district and architectural firms selected. Tracey MacLachlan has been hired to serve as principal for the new Columbia River Gorge Elementary School. Please continue to watch our website, Facebook page, and your school newsletter for opportunities to see the progress as construction takes place over the coming months. How will school attendance boundaries be determined once the new schools are built? The Washougal School District is working with a consultant, Flo Analytics, to gather data and conduct studies on enrollment numbers, development trends and transportation factors to help guide school attendance boundaries. The extensive boundary review process will include research and community input gathered over several months. More details are available on our Boundary Review Process Page. Bond Commitments – Replace the existing Excelsior High School on its current site, removing aging portables and constructing a more functional and larger facility to accommodate 90 students. Community and Staff Workshops and Symposium – Captured desired learning experience through perspectives of students, teachers and community. Creation of unique elements that support effective learning. Identified opportunities that are complementary to the site and serve the student population. Design Team Direction – Worked to understand school building needs of students, teachers, administration and community. Considered ease of maintenance and long-term operational cost of the new building. Site Constraints – Designed to complement topography, weather exposure, existing buildings, tree removal, and small site working area. Captured desirable views, solar orientation and connection to outdoor learning opportunities. Student Circulation / Community Access – Established clear view of parking access and building entry from the street for community use. Easy student access between EHS and WHS, as well as created ADA access. Bond Commitment – New 550 student Columbia River Gorge Elementary school combined with a replacement 600 student middle school on the existing Jemtegaard Middle School site. Community and Staff Workshops and Symposium – Captured desired learning experience through perspectives of students, teachers and community. Creation of unique elements that support effective learning. Identified opportunities that are complementary to the site. Site Constraints – Designed to complement topography, weather exposure, existing buildings, habitat and shoreline buffers, projected species and vegetation, existing fields and vehicle access, the need to maintain ongoing operation of JMS throughout construction. 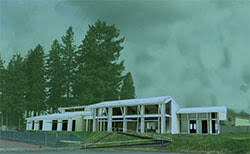 Columbia River Gorge Commission Design Guidelines – Building orientation in response to critical viewing areas. Also considered building form, height restrictions, landscape buffering, grading, site circulation, lighting, size and location of windows, roof overhangs, material selection, and colors. The Washougal School District Board of Directors took action on April 28, 2015 to move forward the $57M district construction project approved by Washougal voters in the February bond election. A contract was signed to hire Richard Yeo of R&C Management to oversee construction and the board announced the selection, pending signed contracts, of two local architecture firms, BBL Architects and LSW Architects, to lead construction design. BBL Architects was selected to work on the new transportation facility, safety and security upgrades at all district schools, and the roofing and HVAC projects at Hathaway and Gause Elementary schools. The firm has considerable experience in the area of transportation facilities in area districts such as Beaverton, Centennial and North Clackamas. LSW Architects has been selected for design of the district’s three new schools. “They are well-respected and had the most experience in new school design among the candidates,” said Tarzian. “They also scored very highly in their experience in working with the Scenic Columbia River Gorge Area permitting process.” The district will solicit parents, staff and community for input on the desired features and amenities of the new schools through future surveys and community forums. “Knowing that we have a fixed budget for the projects, the district will consider input from stakeholders to create safe and secure facilities that will serve our community for many years to come, while at the same time assuring that all of the projects identified for bond resources be completed,” Tarzian said. The planned construction work is the result of a yearlong evaluation by a Long Range Facilities Planning Committee. The committee considered school needs and conditions which lead to a recommendation to the WSD Board to go to voters for a bond election. Recommended projects included several priorities for the district, including improving school entrance safety as well as planning for anticipated growth. The district has grown by an average of 50 students per year over the past three years. The district is currently working to build a master schedule for the projects that is expected to be completed in June 2015. It is anticipated that the three new schools (JMS, Excelsior High School, and the new Columbia River Gorge Elementary School) will open no later than September 2017. Evidence of construction will begin appearing this summer, when fencing will be placed around JMS to assure student and staff safety in the current building while the new facility is being built. Remodeling each school’s front entrance to enhance security will be among the first construction work to get underway in Summer 2016. Information on the construction process will be shared regularly with the community through this page, Facebook page, and school newsletters. The Washougal School Board approved two resolutions at their October 6 meeting to accept the schematic designs of the new K-5 elementary school and the replacement facilities for Jemtegaard Middle School and Excelsior High School. This action helps to formalize the decision as next steps are taken. LSW Architects, the firm designing the three schools, has completed the schematic design phase and with this approval will begin the next, more detailed design development phase. The schematics were developed with input from the staff and community forums, and input from a working group including school administrators. The schematic designs have been reviewed by Dr. Mike Stromme, WSD Superintendent; Joe Steinbrenner, WSD Facilities Director; R & C Management Group, the construction management company retained by the school district; and Todd Construction, the general contractor. The Board’s action follows the process laid out in WSD Board Policy 6920, which requires review and approval of the schematic design prepared by the architect to assure that the new facilities are readily accessible to and usable by individuals with disabilities. The anticipated ground breaking for these schools are the summer of 2016. This work is the result of funding from a $57.67 million bond, which voters approved in February. The bond also included security enhancements to the foyers at all district schools, construction of a new transportation facility, as well as a series of other upgrades and repairs to existing schools. The Washougal School Board, Tuesday, September 22, awarded a pre-construction contract for General Contractor-Construction Manager (GC/CM) services to Todd Construction for the new K-5 elementary school and replacement of Jemtegaard Middle and Excelsior High Schools. The selection of Todd Construction as the GC/CM followed a state-approved process that began with the District advertising a Request for Proposal in the Daily Journal of Commerce and The Post-Record. Four businesses responded to the Request for Proposal and submitted proposals on their approach to the project. The four proposals were reviewed and evaluated by a six person Washougal School District selection committee. The top two applicants were asked to submit a sealed final fee proposal that was opened publically. The most qualified contractor, Todd Construction, was selected. After voters approved a Capital Facilities Bond to address safety and add capacity in our schools, Washougal staff rolled up their sleeves to get down to the business of planning and preparing for the work ahead. The first step for the district is to select a Construction Project Manager who will have general oversight of the entire planning and construction process. The Construction Project Manager will be selected from a pre-qualified group of construction management firms, chosen for their reputations, experience and business practices, through a Request for Qualifications (RFQ) process. The RFQ submission deadline is March 6 and the district expects to have a firm selected by mid-March. The district considered two construction contracting methods and has chosen to use the General Contractor/Construction Manager (GC/CM) method. The GC/CM will be engaged early in the design and planning phase, to ensure the project design meets the program requirements and doesn’t exceed the districts budget. Once the design is complete, the GC/CM will change roles to general contractor with direct oversight of the sub contractors. This collaborative approach will save time and money with a single point of leadership on the entire construction.